Get more knowledgeable about your bike this winter or give the gift of learning this holiday season by registering yourself or a loved one for a Century Cycles Bicycle Maintenance Class! Below is the complete line-up of small-group classes that offer a hands-on education from the best expert bike mechanics in town. Just need to know the essentials, like how to change a flat tire? Check out the FREE basic clinics we're also offering in each store. Want something more customized or advanced? CC 1-to-1 is for you. With all of our classes and clinics, you’ll also receive a 20% discount on all parts, tools, lubes, repair stands, accessories and clothing! Plan to get dirty and leave with a clean, well-tuned bicycle! Learn to clean and lubricate your bike's drive train; adjust brakes, derailleurs, hubs, headset, and bottom bracket; and evaluate replacement parts and upgrades. (2) two-hour sessions 6 to 8pm; $85 per person. Exact same curriculum as above, but without the Y chromosome (well, except for your instructor). (2) two-hour sessions 6 to 8pm; $85 per person. This is our master wrenching class! Learn everything from the Tune-Up class plus receive more in-depth instruction about derailleur adjustment and advanced wheel truing. You’ll also remove, clean, lubricate, and re-install the crankset, chain, and derailleurs on your bicycle. (3) two-hour sessions 6 to 8pm; $125 per person. • Medina: January 11 at 6:30 p.m.
• Peninsula: February 12 at 1:30 p.m.
• Rocky River: March 15 at 6:30 p.m.
Do you want to take one of the above classes, but can’t fit it into your schedule or prefer one-on-one instruction? Or, do you want to learn something more customized or advanced, like wheel-building? 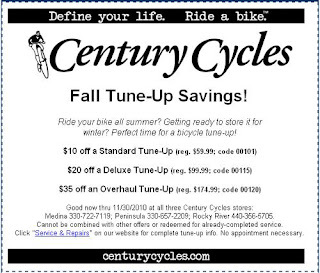 Century Cycles offers CC 1-To-1, where you book a time and topic with one of our bike mechanics. 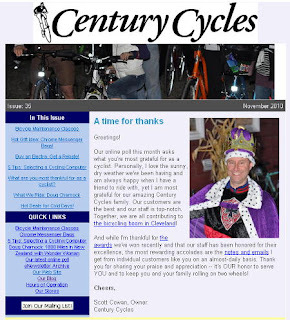 (Example: Last year a customer booked CC 1-To-1 time to have Century Cycles mechanics help him with a winter project to overhaul an old road bike and make it into a single speed.) $75 per hour. By appointment only. To register for any of the classes listed, call or visit the store you want to attend to reserve your class spot: Medina 330-722-7119; Peninsula 330-657-2209; and Rocky River 440-356-5705. Payment is due at the time of registration. The classes are oriented toward multi-speed bikes manufactured after 1985 and are not suitable for BMX, recumbent, tandem, or coaster brake bicycles. Missed classes cannot be made up or refunded. For more information, go to www.centurycycles.com/for/class. 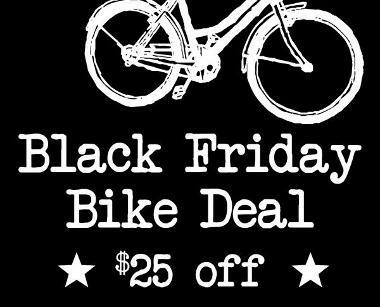 To help you avoid the mall chaos and thank you for shopping LOCAL for the holidays, Century Cycles is celebrating its first-ever Black Friday Weekend! Stop in to experience the black-tastic fun Friday, November 26, through Sunday, November 28! $25 off all BLACK bikes (and tires count)!!! Check out the 50%-off Hot Deals on BLACK Pearl Izumi AmFIB Tights and BLACK Mavic arm, leg, and knee warmers! 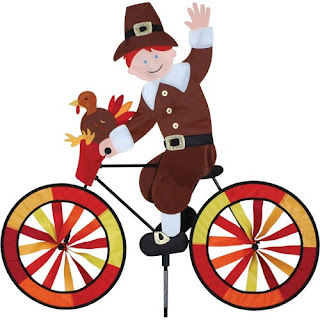 Enjoy a sweet treat of BLACK licorice while shopping for gift cards (the #1 preferred gift of local cyclists! 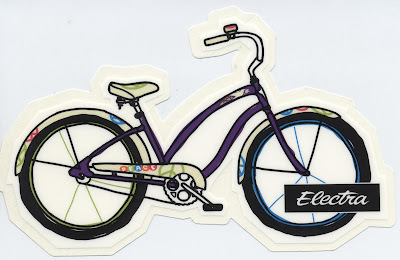 ), 2011 bicycles, stylish and functional winter clothing, bike commuter accessories, and new products from Chrome Bags, Clean Bottles, NiteRider Lights, and more! This weekend would also be an excellent time to take advantage of our Fall Tune-Up Coupon! This is your LAST CHANCE to save $10 on a Standard Tune-Up, $20 on a Deluxe Tune-Up, and $35 on an Overhaul Tune-Up! See the Service and Repairs section of our web site for descriptions of the Tune-Up options and what's included in each. Thanksgiving is the holiday we reflect upon the bounty and goodness in our lives -- and the same goes for our lives as bicyclists. There's a new kid on the block in the bicycle chain lubrication market. With traditional chain lubricants, you want it to be heavy enough that it's able to do the job of keeping your chain lubricated effectively, but you want it to be light enough that it doesn't attract dirt and get all gunked up right away. Most chain lubes try to strike a delicate balance between these two requirements, some with more success than others. The makers of Chain-L No. 5 took a different approach. Your chain has more moving parts than the rest of your bike combined; it is essentially a set of over 100 bearings. They formulated a lube that will do as good a job as possible in keeping those bearings running smoothly. So, Chain-L No. 5 will take will take a bit more preparation and care when applying. Tom, one of our mechanics in the Medina store, has been the guinea-pig for Chain-L No. 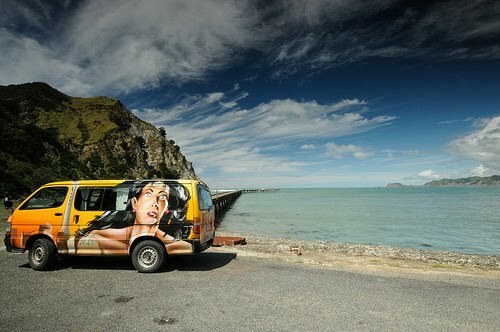 5 before we decided to start selling it. Tom could not contain his excitement about Chain-L No. 5, and in his own words, he does not get excited about too many things. He put it on his road bike in July of this year, and on his mountain bike in August. Neither have had to be re-lubed since then, and both are still running strong and smooth! 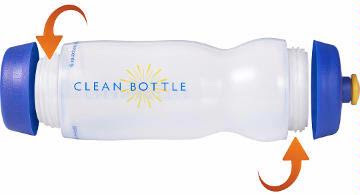 Check out their web site at www.chain-l.com for the full story of this revolutionary product, including application instructions and other frequently-asked questions. You can now buy Chain-L No. 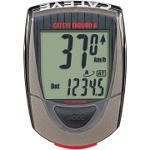 5 at all three Century Cycles stores, or on our web site. So, this report is two weeks late in coming. By web standards, that's ancient history, so I thought, at this point, who cares? But people keep asking me about it, so I thought I'd put the whole sordid tale here for posterity. It is not a tale of strength and triumph, but one of misery and woe. 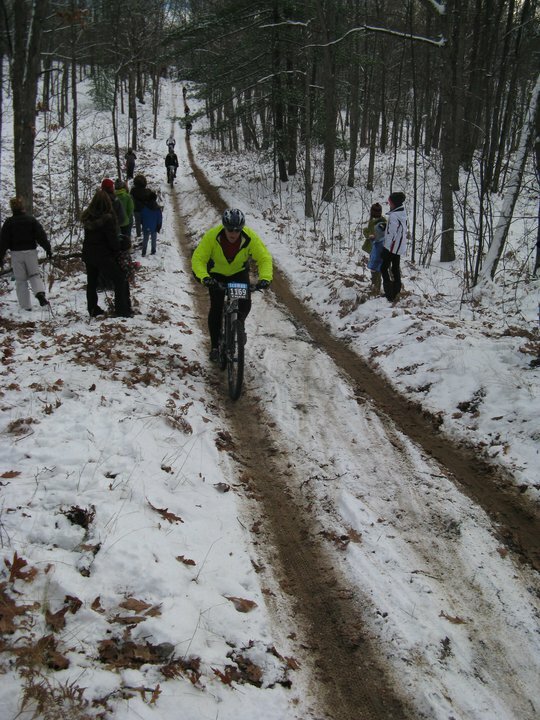 The Iceman Cometh Challenge is a mountain bike race held on the first Saturday in November in the northern reaches of Michigan's lower peninsula (not up in the U.P.). 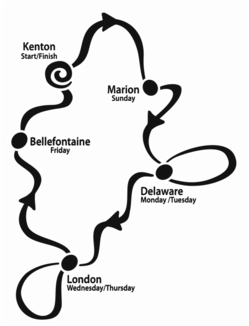 It's usually around 27 or 28 miles (depending on how they need to route the course from year-to-year). 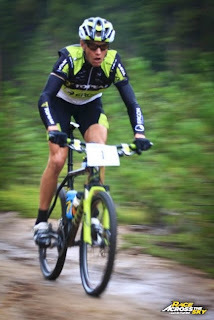 The course is not a loop; it's point-to-point, starting in the city of Kalkaska, and ending just outside Traverse City, taking racers over gravel roads, dirt roads, doubletrack, singletrack, and cross-country ski trails. This was the 21st annual running of the Iceman, and my eighth time testing my off-road riding skills at the event. Evey year, I've managed to improve my time over the previous year, and/or improve my position within my age group. I didn't expect that I'd be able to continue my trend of continuous improvement this year, though. As the name Iceman suggests, the conditions for the race are often what you might expect for the weather in northern Michigan in November. However, in recent years, the weather has been more and more what you might call downright pleasant. The 2009 race saw temperatures peek up into the 60's, with the joke among insiders that they should start calling the race the "Niceman." That being said, it seems like every year, no matter how cold or how warm the conditions were, I have ended up being over-dressed during the race. The old saying goes, "If you're warm enough before the start, you'll be too warm during the race." But it's always so hard to dress lightly enough as you're standing around the parking lot with the wind and snow flurries whipping around. For the '09 race, I was faced with the rare dilemma of not have enough warm-weather clothing, and had to race in that 60-degree day in a long-sleeve wool jersey, knickers, and ski socks. I knew, based on the forecast, that it was expected to be a lot colder this year, but I was determined not to make the same mistake of over-dressing once again. It was with that in mind that I thought, when packing the day before leaving, "Nah, I don't need those winter cycling boots. 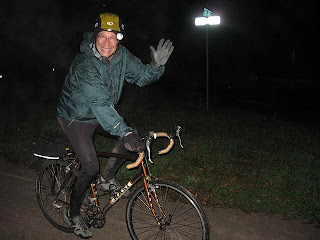 Nah, I don't need those winter cycling gloves." I had taken my cyclocompter off of my handlebar to avoid any mishap with it possibly flying off while the bike was on the roof rack during the long drive. While getting my bike ready before the race, I zip-tied my number plate in place, then realized I didn't leave enough slack to get my computer back on. I loosened the computer mount, trying to get it to a position that would work, but it seemed like either the numer plate pressed down on it, constantly resetting it, or the number pushed up on it, making it impossible to reset or switch modes. I finally seemed to get it to a position that would allow it work, although I might not be able to see it very well while riding. Further bike preparation involved pumping up my tires; my ideal pressure for mountain biking is around 37psi, which I'm accustomed to getting using my own floor pump. When I used my friend Brent's floor pump, when I got to 37, my tires seeme a bit more firm than they should have been. I let a bit of pressure out, hoping that would do the trick. I managed to wiggle my up to the starting line at the front of my wave group. Brent was scheduled to start two waves after me, six minutes later. As the horn went off and we took off up the street in Kalkaska, my fingers and toes immediately went numb from the breeze. A few blocks from the start, we headed into the woods, meaning a little slower speed and less wind. So, I spent the first few miles wishing my extremeties would warm up and I could enjoy the ride more. This finally happened around the 5-mile mark, so I was finally able to sette into a rhythm and enjoy the terrain and the scenery. The temps were in the upper 20s to lower 30s, plus the area had gotten a couple inches of snow. You'd expect that the packed trails and frosty roots would be slippery in these conditions no matter what, but it seemed like I was slipping and sliding around even more than I should have been. Around the 7-mile mark, I got to one of the first steep, bumpy descents, and got through it pretty handily, but as the trail smoothed out, it took a sharp bend to the right on a particularly frozen patch. As I rounded this corner, my wheels slipped right out from under me, and I came down HARD and solid on my right side and right shoulder. I heard ominous crunching noises coming from my shoulder as this happened, and this being the same collar bone that I broke six years ago, of course the first thing I thought was, "Uh, oh, here we go again." I picked myself and my bike up, and as I brushed the show off of myself, my shoulder seemed to be able to move almost normally, although a bit stiffly. I didn't near any more crunching noises (or feel any searing jabs of pain), so I surmised I was able to keep riding. As I re-mounted and tried to start pedaling, I realized my chain had come off my chainrings, so I had to dismount again to put it back on before I could finally get going again. The next couple of miles, I thought maybe I should let more air out of my tires to get more traction and prevent another slippery mishap. In the meantime, I also felt the urge to, er, eliminate some of the coffee and other pre-race hydration. 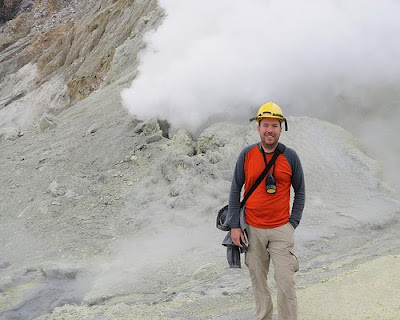 I didn't want to lose any time by stopping for either task, though, and especially hoped that Brent would not make up the six-minute start difference and catch up. As I proceeded, even though my shoulder felt okay during mild sections, it was kind of sensitive on rough patches, especially on bumpy descents. So, I figured since I wasn't going to be breaking any records anyway, I may as well be comfortable for the remaining miles, so around mile 10, at the top of a heinous climb, I stepped off to the side of the trail. I emptied my bladder behind a tree, then tapped my valves a few times to let a few more pounds of air out of my tires. Just as I finished this, I saw Brent topping the climb! He asked, "Are you alright?" I said, "I think so," although not entirely convinced myself. Brent headed on forward, and I took off behind him, although I lost sight of him right away. It was just before this that I also realized that my cyclocomputer was not working; it had barely gotten past reading 6 miles. I'm not sure if it was because of the number plate issue, my sensor had gotten knocked out of whack, or my battery was dying, but either way, I had no choice but to just ignore it and press on. Around the 18-mile mark is the Williamsburg Road crossing, the only paved-road crossing on the course, and where many spectators gather to catch a view of mid-race action. I passed up Brent's wife Sarah alongside the climb leading up to the road crossing; I'm sure she knew I must not have been having a good day, being that she had seen Brent go by before me. A couple of miles after the crossing, I was surprised to come upon Brent, crouched on one knee next to his bike on the side of the trail, kneeling almost as if in prayer. Now it was my turn to ask, "Are you alright?" He replied, "Cramps! How are you doing?" I said, "Not bad for maybe riding on a dislocated shoulder." We both caught our breath, and then continued, leap-frogging each other on-and-off for the remaining miles. It was around this time that I noticed my cyclocomputer had switched to "sleep" mode, completely out of commission. The last seven or eight miles of the course have some of the steepest climbs, and this is where the miles really start to take their toll on you. However, when you get past these hills, you have a nice cruise for the last two or three miles to the finish, and when you start to hear the PA announcer during the last mile, you actually regret that your ride is over. I did NOT feel that way this year; I have never been so glad to know that I was almost finished. As I approached the end of the fenced-in finish chute, I figured I may as well do an all-out sprint to save whatever seconds I could. Not even 50 feet from the finish line, I started passing this guy on the left, and I had plenty of room between him and the fence, until he started drifting to the left. I should have yelled or something, but I was tired, and why he felt the need to swerve over 50 feet before the line was beyond me, anyway. So, as he drifted over, my front wheel got tangled in his back wheel, and we both went down HARD. 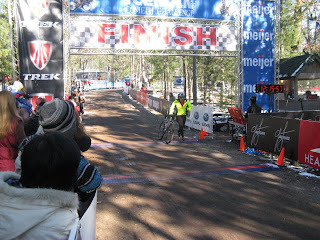 He yelled a few four-letter words of encouragement, then picked up his bike and ran across the finish line. I started to get back on my bike, but found that the crash was so hard that it turned my handlebars 90-degrees sideways. So, in a fitting end to a race fraught with disaster, I picked up my bike, and sensing a bruised left knee from the crash, literally limped across the finish line. All I wanted to do was find a tree or bench or anything I could sit or lean on to take a load off, and when I finally did, a saw Brent and Sarah standing there behind me; he had crossed the line about a minute after me, and so ended up with an overall time about 5 minutes better. We checked our official time on the results board a few minutes later, and I showed an official finish of 2 hours, 32 minutes, and 59 seconds--my worst Iceman time ever. However, I later found out I was 40th out of 90 in my age group, so I guess I can't complain still being in the top half. I enjoyed some pizza and a couple locally-brewed beers at the finish expo, as well as sight-seeing and partaking of more local restaurants in Traverse City and around the area. My left knee that I landed on just before the finish line hurt like a son-of-a-gun all that evening, but has not made a peep since. My right shoulder has been getting progressively better each day; I almost have full range of motion back, and I don't think there's any permanent damage. So, despite my disappointing race performance, the Iceman weekend never fails to disappoint for a fun road trip and a well-organized event. I can take away valuable lessons learned this year: be prepared, make smart choices, and don't let past successes lull you into over-confidence. 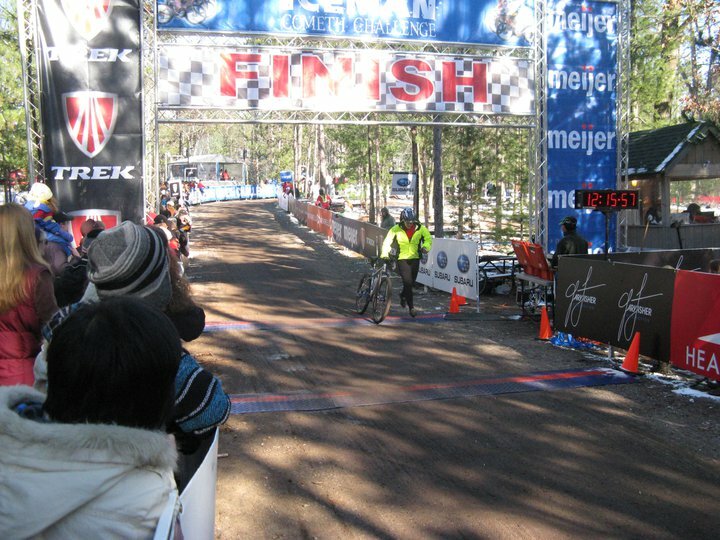 If you're interested in checking out what the Iceman race is all about, registration will be open on March 1, 2011 at http://www.iceman.com/ for the 2011 race. Sign up early, as it fills almost immediately, and for good reason. Chrome started in Boulder 14 years ago and has just made its arrival at Century Cycles! Back in 1996, Chrome's founders couldn't find bags that met their standards, so they headed to the garage with the toughest materials they could find and started sewing. Today they are one of the most popular bags around for bike messengers, commuters, or anyone who is looking for a practical way to carry their stuff in style -- largely because the products adhere to the founders' anti-nonsense commitment to make functional products born of utility and purpose. 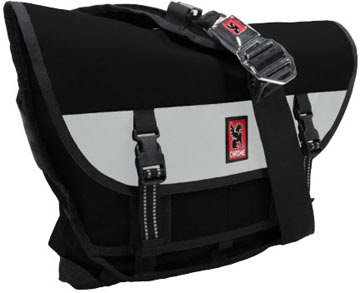 Chrome Bags feature weatherproof construction, loads of pockets for organizing your phone, laptop, etc, and they use Chrome's unique recycled car seat belt buckles. And if that's not enough, Chrome Bags are made right here in the USA. Any are the perfect Christmas gift for the dedicated cyclist on your list (or yourself)! Half-off prices valid Nov. 18 - Dec. 1 2010 only. With Hot Deal #2, we’ve got you covered for mid-season rides and the chillier days to come! Mavic Arm Warmers are form-fitting and highly elastic, offering excellent moisture management. 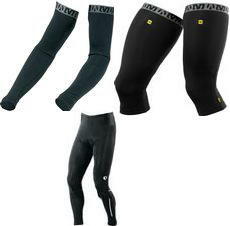 Mavic Knee Warmers and Mavic Leg Warmers are pre-shaped and highly-stretched brushed fabric. The leg warmers have flatlock seams and an ankle zip for comfort, plus reflective highlights for safety. Pearl Izumi AmFIB Tights for Men and for Women offer maximum warmth and comfort for colder conditions. Windproof, water-resistant AmFIB fabric is on the exterior. Pearl’s ThermaFleece fabric is on the inside, trapping heat next to your skin and wicking away moisture when cycling, cross-country skiing or tobogganing. 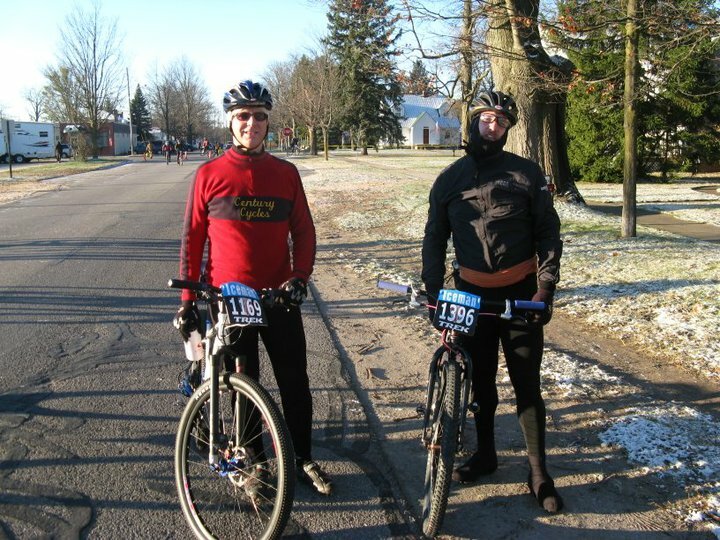 Mid-season rides can be hard to dress for, with temperatures that may be in the 30s in the morning, in the 60s and sunny by lunchtime, and chilly again at nightfall. That’s where arm, leg, and knee warmers help you conveniently adapt to quickly-changing temperatures. They may look a little funny, but once you try them, you'll like their versatility. You’ll also appreciate their convenience -- when you take them off mid-ride, they are small enough to easily stuff into your jersey pockets or trunk bag. This Hot Deal is good only November 18 – December 1, 2010, while supplies last. In-store purchase only; no online or phone orders accepted. No coupon necessary. Click here to vote for Century Cycles as BEST Bike Shop on the FOX 8 HOT LIST. Every vote counts and we're grateful for yours. Thank you! 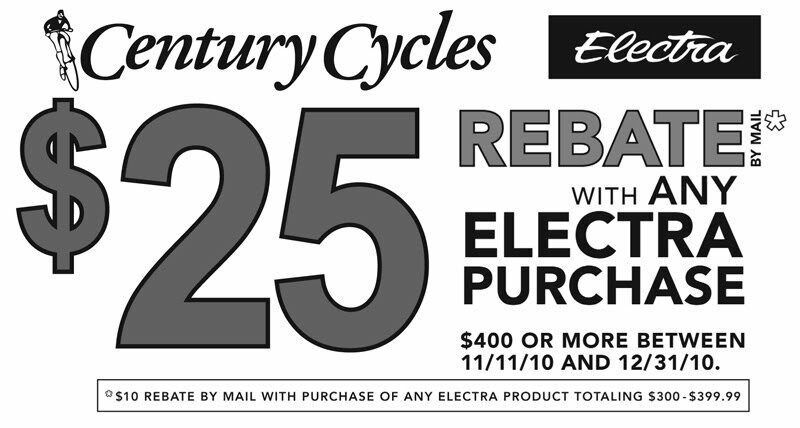 Electra Bicycle Company is wishing everyone a happy holiday season by bringing back its popular holiday rebate program! 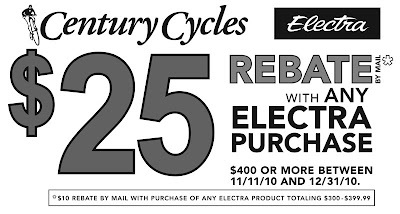 Purchase any Electra Bicycle (or combination of an Electra Bicycle and/or Electra accessories) valued at $400 or more between now and the end of the year, and get a $25 mail-in rebate from Electra. Click here for full details and to download a rebate form. The Plain Dealer: "Cleveland cyclists take to the road"
Yesterday's Plain Dealer had this front page story (accompanied by the photo above) about the bicycling boom in Cleveland. 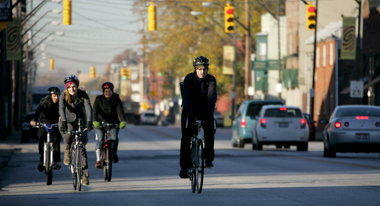 The story by Tom Breckinridge reported the results of a NOACA survey that show bicycling up 50% in the city and cited recent bicycling-related developments in northeast Ohio, including the anticipated spring opening of a downtown bike center and RTA's report that drivers count about 50,000 bikes a year on buses and trains. A basic bicycle tune-up once a year can go a long way towards extending the life of any bicycle. It can make an old bike run like new, plus prevent minor problems from becoming major ones. NOW is the perfect time to bring your bike in for a tune-up -- beat the spring rush, care for a bike that has been pedaled all summer long, get it ready for either more riding or winter storage, and SAVE up to $35 with the coupon below now thru November 30! * These prices don't include sales tax. If you have a tandem or recumbent bicycle, you'll need to add $20 to the price. Now right-click on this coupon, print it out, bring it in with your bike, and we'll take care of the rest! We give our thanks to all who have so nobly served our country -- past, present, and future. If you didn't see the all-new "Race Across the Sky: 2010 Leadville 100" movie when it played in theaters around the country last week, you have a last chance TONIGHT to see a special encore performance. I'm scrambling to find a sitter so I can go to the 7:30 p.m. show at the Regal Cinemas at Crocker Park in Westlake (tickets: $12.50 each). It's also showing at movie theaters at Severance, Montrose, Hudson, Fallen Timbers and Canton. Click here for tickets. In 2009, "Race Across the Sky" captured the imagination of countless mountain bike enthusiasts when Lance Armstrong not only won the Leadville Trail 100 Mountain Bike Race, but set a new course record that seemed unattainable. This year, "Race Across the Sky 2010" delves into the resulting race entry boom, including record numbers of citizen riders, all with their own personal reasons for challenging themselves to this epic test of will, strength and endurance. Joined by the toughest elite field this high-altitude century race has ever seen, these riders are tested by one of the most brutal courses known to the sport. From the center of the little mining town of Leadville, Colorado, to the 12,570-foot top of Columbine Mine, get ready to be inspired all over again. 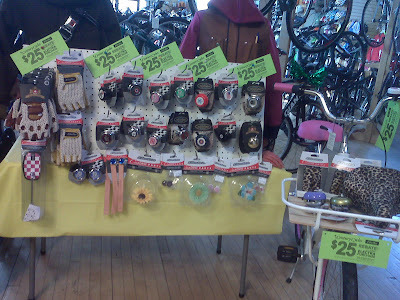 Hot Deals were a hit last year and we're happy to announce that once again, our buyer Patti Grauel has negotiated amazing 50% off deals on our most popular bicycling accessories! We're passing the savings on to YOU with a new "Hot Deals for Cold Days" offer every two weeks, now through February. Stock up on essentials, shop for the holidays, and save on your cycling favorites! 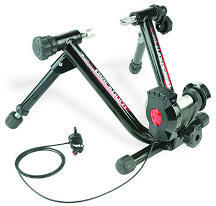 Hot Deal #1 is a whopping 50% off the Blackburn Tech Mag Trainer! That's a trainer for half price, folks, available in all three stores while supplies last! 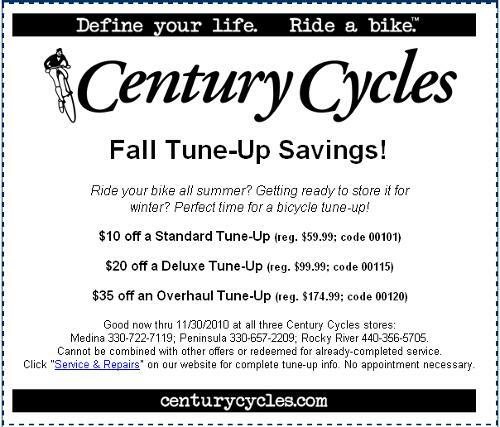 This is a discount we've only offered once before in our 19-year history at Century Cycles! If you've been thinking of trying indoor riding, this is the trainer (and deal!) for you! The Blackburn Tech Mag Trainer features six quiet, silky-smooth magnetic resistance settings, easily selected via a handlebar-mounted remote and perfect for fine-tuning your workout as you get fitter and fitter. It also boasts a sturdy chromoly frame that folds for easy storage and transport, as well as Blackburn's secure, easy-to-use FastCrank bike mounting system - all for just $114.99! Maximize your workout by reviewing our 5 Tips for Indoor Training and also consider purchasing a few trainer accessories: A climbing block to provide extra stability and a hill-climbing workout, a training mat to protect your floor or carpet, and a training video (learn from industry experts from DVDs available from Cyclops and Carmichael Training Systems, or download a regimen for free at many popular cycling websites). This Hot Deal is good only November 8 - 17, 2010, while supplies last. In-store purchase only; no online or phone orders accepted. No coupon necessary. Want to receive Hot Deals for Cool Days by e-mail to your Inbox? Click here to sign up! 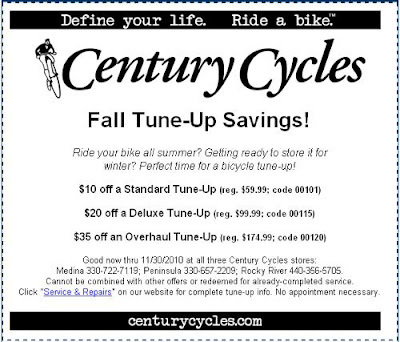 PLEASE NOTE: Starting this week, all three Century Cycles stores are starting our Fall Hours. All this means is that we will be closing at 5:00pm on Fridays and Saturdays. Hours of operation on other days are unchanged; we are still open until 8:00pm on Mondays through Thursdays. 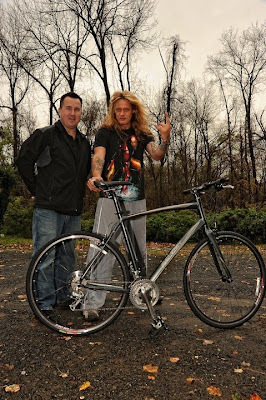 Sebastian Bach of Skid Row fame shows off his new Raleigh Cadent FT3 in fine rock star fashion, complete with devil horns! Bach won the Raleigh bike as part of VH1 Celebrity Fit Club Boot Camp, on which he recently lost 18 pounds. The show wrapped up last summer, but the bike couldn't be delivered until Bach got back from touring Europe with Skid Row, where the band was opening concerts for Guns n' Roses. He's pictured with Chris Budich, Raleigh's rep for the New Jersey area, where Bach resides with his family. 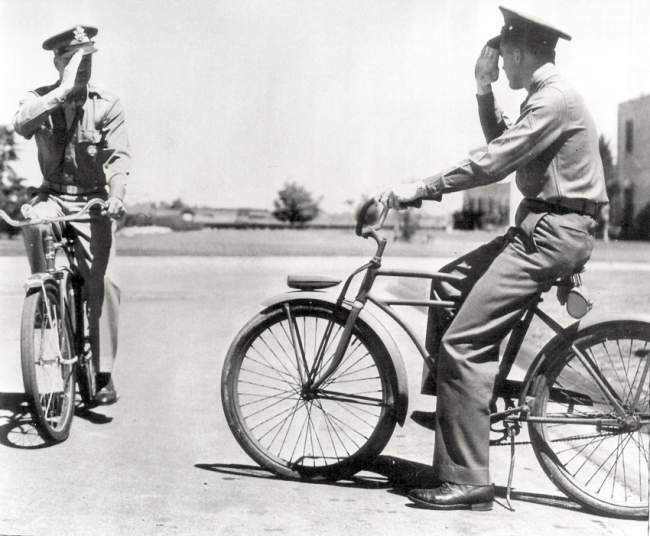 Service your bike - or let us do it for you! Before storage, we recommend you clean your bike, lube the chain and all moving parts, inspect and adjust the brake pads, and put air in the tires - all things that we can do (plus much more!) in our Standard Tune-Up. Click here to learn more about your tune-up options and beat the spring rush! Keep your bike away from damaging road salt. Road salt and snow/rain can deteriorate a bike quickly. If you ride at all in winter conditions, re-clean and dry your bike immediately afterwards. Be wary that snow, ice, and salt dripping off of your car in the garage may be another unexpected source of contamination! Store your bike up off of the floor. Whether it's in your garage, basement, or shed, hang your bike by the frame or by one or both wheels. The weight of the bike will not hurt your wheels. This keeps your bike out of the way, and keeping it off the bare floor also prolongs the life of the tires. We have a selection of hooks and racks in each store, but if hanging your bike is not practical, set it on the floor on a rug or a mat made of rubber or plastic. 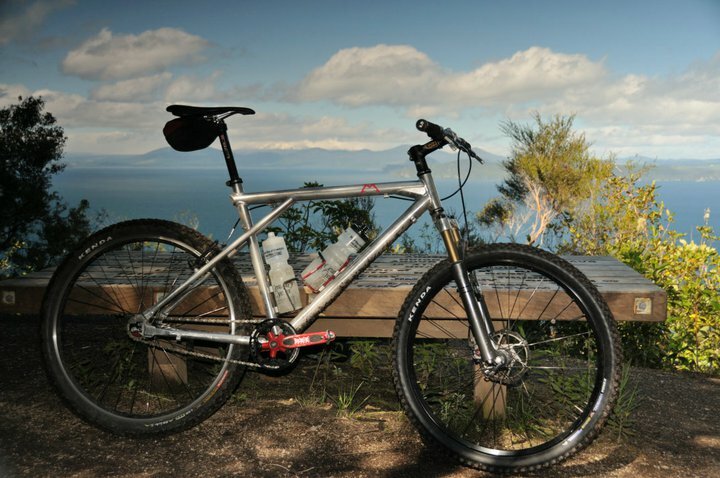 Steel bikes should be kept in a heated space to prevent condensation in the tubing, which causes rusting. Empty water bottles and hydration packs. Don't leave water bottles in the cages. Be sure to clean and dry everything thoroughly before storage. Is your household suffering from an overabundance of Halloween candy? 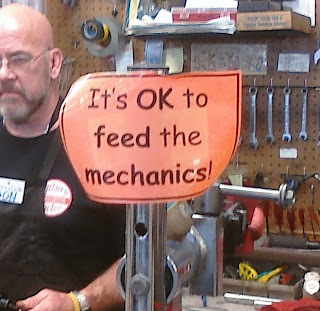 Your local bicycle mechanics are happy to help! You may recall a year or so ago, NBC Today Show anchor Natalie Morales was training for her first triathlon and the program ran a series of stories as she was getting ready for the event. We're happy to report she trained and competed on a Giant Avail 1 and it seems she likes the bike! A year later, last month's issue of Triathlete magazine featured Natalie in a cover story on how she balances work, motherhood, and triathlons -- and the cover photo reveals she’s added aero bars to the same bike. Want to test ride a Giant Avail to see for yourself what Natalie likes about it? We have Giant Avail 1s in stock in a full size run in Medina, Peninsula, and Rocky River. Be sure to check out the Giant Avail 3 while you're in, too -- as well as the Giant Avail Advanced 3, a terrific carbon bike with a beautiful purple paint job! Want to hear some triathlon training tips from Natalie? Click here. Check out the October issue of Ohio Magazine -- it features "Cycling Through Autumn," a terrific cover story about seeing Ohio's best fall colors from the seat of a bike, plus it mentions Century Cycles' Night Rides in the section about the Towpath Trail in the Cuyahoga Valley National Park!